When Lodgers B’s David Kime went 2-0 sets up in the first game of the evening against Simon Raistrick of Lodgers Blades, no-one could have foretold the drama that was about to unfold, Simon snatching the third end 16-14 before taking the next two ends and the game. This spurred Simon on, beating Trev Blackbourn, again in five sets, and Colin Bell in four to make it a memorable evening for the Blades captain in this Boston and District Table Tennie League Division One contest. Scott Raistrick was unlucky to lose to Trev and Colin, both in five sets, but gained some reward for his efforts with a straight set win over David. Gavin Read beat Trev, and went down in five to Colin to leave the final score a very competitive draw. Graves Park A continued their rise up the table with a fine 8-2 result away to Lodgers C, Rob Smith taking his three, winning the crucial third set against Scott Sykes 16-14 on his way to a four set victory. Scott picked up two, against Phil Brooks and Alan Reetham, although Alan made life as difficult as possible in the four tight sets. Andrew Pocklington went 2-1 sets up against Phil, but Phil hit back to win in five, whilst Andy Birks had to be content with some close ends against Phil and Alan. Despite some close ends, and five-setters, Graves Park C received a bit of a mauling at the hands of a rampant Stickney team, with Paul Hartnett and Jack Christian being unbeaten. 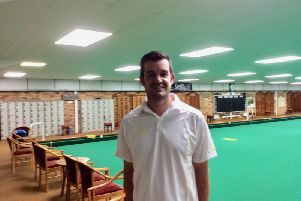 James Quinton and Martin Walters both took Jack to five ends, whilst another five-setter, pitting Gavin Herberts against James, saw the Park’s only singles victory. Mick East traded deuce ends against Gavin, whilst Martin was beaten in two deuce ends against Paul, the doubles being the Park’s second, and final, victory of a long and disappointing evening for them. Visitors Sibsey C will have left Wrangle feeling that they should have received something for their efforts after a frustrating and pointless evening’s table tennis. Roger Hooton went down in five sets to Dave Coulson, whilst Dave Smith was 2-0 sets up against Sam Cooper, only to lose the next three. Against Pete Evans, Dave was 2-0 sets down, pulling back the next two – but lost out in the deciding leg. Chris Cooke was 2-0 sets up against Dave, but lost in five, and so the match rolled on, Sibsey C feeling that it was just not their night. Division One: Lodgers Blades 5 Lodgers B 5, Lodgers C 2 Graves Park A 8, Stickney 8 Graves Park C 2, Wrangle 10 Sibsey C 0. Division Two: Mayflower Pilgrims 9 Graves Park Nomads 1, Lodgers D 5 Graves Park E 5, Graves Park D 7 Lodgers E 3, Sibsey D 1 Sibsey A 9, Graves Park Nomads 2 Graves Park D 8, Graves Park E 4 Belchford 6.